It's been eons since the Lunch Bunch and I got together. Months, in fact! Our original plan for this Tuesday in June was to go to the Nelson and see the reunited Monet Water Lilies. But LBer Joyce had knee replacement surgery in May, was still getting physical therapy, and didn't feel that she would be able to go. Like the Three Muskateers, the Lunch Bunch is "one for all and all for one" so we changed our plans. With the garden coming around and the house clean, there could be company for lunch and so (working around Joyce's PT) we decided that the June lunch would be at Linderhof. It was too hot for the porch or the garden, but the breakfast room is still a great place for lunch and I set the table with special care . 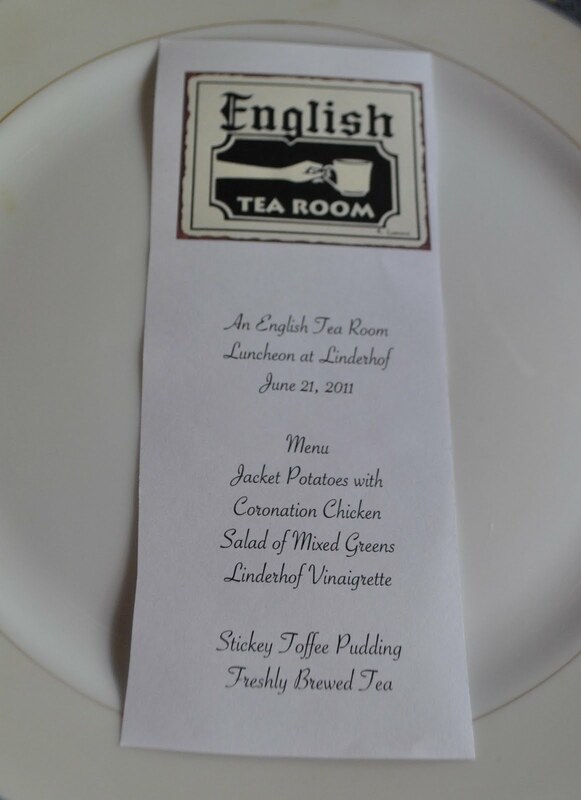 . .
For the theme would be a tea room lunch, a recreation of a tea room lunch that I had had while in England. In Salisbury to be exact at a darling tea room that we frequented not once but twice! 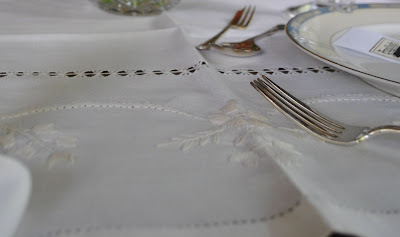 My new tablecloth, with the beautiful hand stitching. A souvenir of the Azores. 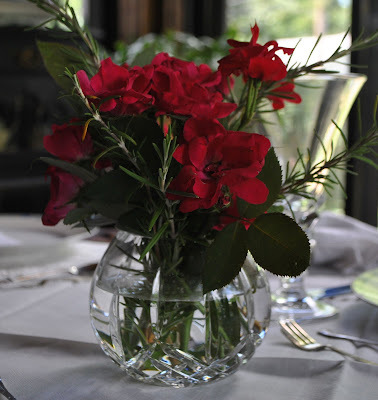 And roses as a centerpiece, studded with rosemary in a crystal rose bowl. Which we always do when we have company. It's a little touch but one that makes any luncheon for company at Linderhof special. Not my beloved blue and white but blue and white sort of. Or rather cream and white. Noritake dishes from the 20's. White center, cream rim and a band of blue with wee pink flowers. Jim's grandmother's cutlery, the napkin in a silver napkin ring which had been polished (in fact all of them are polished for we're having lots of company on Thursday and Linderhof needs to shine!) Pastry forks and matching dessert spoons. They came in a presentation box and they're English but I've forgotten where I got them. Placed as they were in England above the plate. The table in the breakfast room all ready for company! 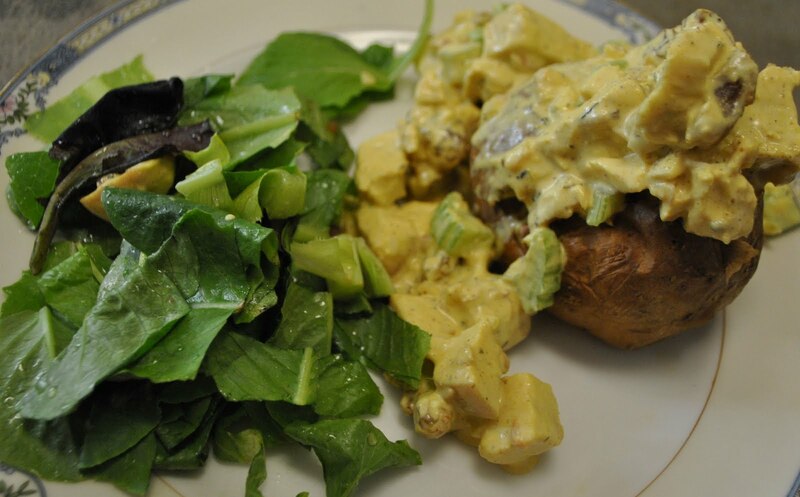 Constance Spry's Coronation Chicken Salad in a Jacket Potato with a green salad on the side. It's a strange combination but I found it delicious when I ordered it in that Salisbury tea room. The cold curried chicken and the hot potato are really really good! Sticky Toffee Pudding. Served with whipped cream and a bit of crystalized ginger. It's one of Daughter Sarah's favorite desserts and was frequently on tea room or pub menus in England. The recipe, however, is not from England but from the Barefoot Contessa. It may be the classic recipe but I did get it from her show. It's easy to put together. Actually makes two so there's one for the freezer and for another day. And it is soooo good!!! Preheat oven to 350. Butter and flour two 9 inch round cake pans or 20 muffin tins. Place the dates in a large saucepan with 3 1/2 c. cold water. Bring to boil, stirring a little to break up the dates. Then leave to simmer for 1 minute before removing from the heat. Stir in the baking soda (which will cause the mixture to bubble up). Cream the butter and sugar together in a food mixture until pale and creamy. Add the eggs, one at a time, occasionally scraping down mixing bowl. Add the vanilla extract and then the flour and salt and mix briefly to give a lumpy dough. Next, add the warm date mixture in two batches. Scrape down the sides of bowl in between mixing. The dough will now be quie watery but don't worry! Fnally add the baking powder (this will bubble up also). Pour the batter evenly into the two pans or muffin tins. Bake for about 30 - 40 minutes for cake pans and about 20 minutes for muffin tins. Test if they are cooked with a small knife or toothpick. It should come out clean when cakes are done. Meanwhile, to make the sauce, combine the butter, brown sugar, heavy cream and vanilla in a medium saucepan. Bring to boil and then reduce to simmer gently for a minute or two until thickened and well blended. 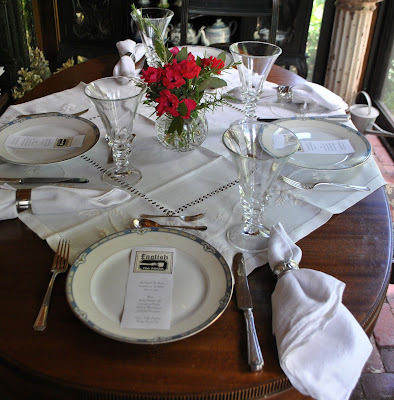 It's Thursday and I'm joining Susan at Between Naps on the Porch for Tablescape Thursday. See all the other tables that are posted this Thursday when you join Susan. Lucky friends...how delightfull! love the rosemary with the rose! this is so darling - that menu is beyond special! I love it! Martha you have so many wonderful recipes! Is there any way they could be link listed in your sidebar? Your table looks very nice. Love the tableclothe. I am so glad you're entertaining once again @ Linderhof...I'm sure the ladies were ever so attentative as you shared a story or two of adventures in England!The table is exquisite and your menu printed on each plate makes my heart swoon! 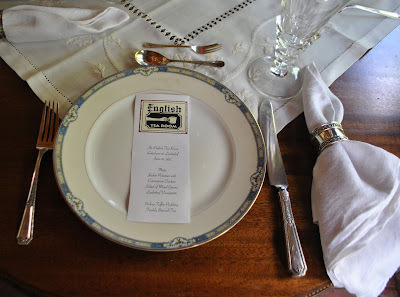 Thank you for sharing this lovely English Tea Table Lunch! You prepared a wonderful treat for your gathering. Lucky friends. :) Thanks for sharing and for the recipe. YOu always set the most elegant tables!Beautiful table linens which are the perfect backdrop for pretty roses and rosemary! Thank you for the Sticky Toffee Pudding recipe!It looks so delicious! Pretty table and linens. The food looks and sounds really good. Oh this brings back such memories. 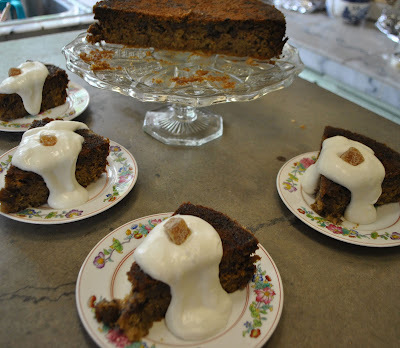 Sticky toffee pudding - such memories of London. Lucky Lunch Bunch - it looks delicious! Lovely! Your attention to detail is so special. I'm sure the Lunch Bunch is always happy when the affair is held at Linderhof! Beautiful table, Martha. The food looks wonderful too. I will try the potato/chicken combo, next time I make curried chicken salad. Thank you for you comment on my blog. Your tea party looks so inviting and fun. It looks like you have a history with Great Britain. Did you live there or just visit? I went to the famous Stonehenge in 1972 and found it very interesting. I know you were happy to have the lunch bunch at your home once again. Your new tablecloth is beautiful, the table set perfectly and menu looks fabulous as usual. It looks delightful, and delicious. You set a lovely table. I'm glad you shared it with us. I love curried chicken and curry and potatoes is a fabulous combination too. But the dessert is what really got my special attention! Yum. What a lovely luncheon! 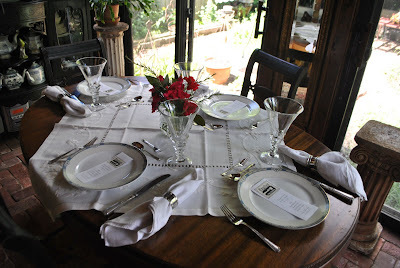 Your table looks so beautiful; I especially love your new tablecloth and those gorgeous goblets. How wonderful that you and your friends can enjoy time together. The menu sounds and looks yummy! Perhaps It Pays to Wait!